UPDATED: Sat., Nov. 3, 2018, 3:54 p.m. In Washington’s all-mail elections, ballots must be postmarked or deposited in a drop box by 8 p.m. Tuesday. But elections officials continue to accept and count properly post-marked ballots for more than two weeks. The Washington Legislature, like the U.S. House of Representatives, could be shaken up by the results of Tuesday’s midterm election. But it could be a week or more before the makeup of either is clear. If control of the U.S. House comes down to one or two positions and any Washington races are close Tuesday night, the parties and their potential majority leaders may be biting their nails and regularly refreshing the state’s elections website for a couple of weeks. The chance for cliffhanger elections may be even greater in the Legislature, where Democrats currently have a one-vote majority in the state Senate and a two-vote majority in the House. Washington’s all-mail voting system could leave winners in doubt for much of November because tens of thousands of ballots received during that period are counted if they were postmarked by Tuesday. Washington is thought to have three competitive congressional races: Eastern Washington’s 5th District race between incumbent Republican Cathy McMorris Rodgers and Democrat Lisa Brown; southwest Washington’s 3rd District race between incumbent Republican Jamie Herrera Beutler and Democrat Carolyn Long; and an open seat in the 8th District, which spans the Cascades from suburban Seattle to Chelan and Kittitas counties, where Republican Dino Rossi, a former legislator, faces Democrat Kim Schrier, a pediatrician. Millions are being spent to sway voters in all three districts, where ballot returns were running ahead of the state averages last week. 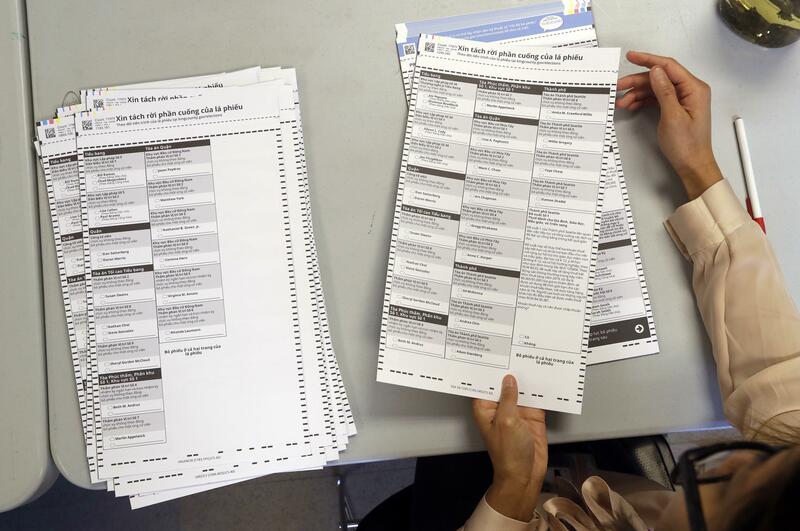 But the largest number of ballots traditionally arrive in county elections offices on Election Day and the day after. Washington has 49 legislative districts where turnout, intensity and spending vary, but a few shifts from Republican to Democrat, or vice versa, could mean big changes in the 2019 session. Although 26 Democrats hold Senate seats, one of them regularly votes with the 23 Republicans, essentially giving Democrats a 25-24 majority in the 2018 session. This year, 25 of those seats are up for election – 11 Republicans and 14 Democrats, although one is Sen. Tim Sheldon, a Potlatch Democrat who votes with the GOP. The 24 not facing election are evenly split between the two parties. Washington’s election system allows two members of the same party to advance to the general as long as they finish in the top two for the primary. That happened in several districts, including south Puget Sound’s 35th, where Sheldon finished second to Irene Bowling, another Democrat. In suburban King County’s 48th District, another matchup with two Democrats has incumbent Patty Kuderer facing former Sen. Rodney Tom. During his past few years in the Senate, Tom, like Sheldon, voted with Republicans to give them a coalition majority. Although all four candidates in the two districts are nominally Democrats, it matters to both parties which Democrat wins. There are three open Senate seats, two currently held by Republicans and one by a Democrat. The Democratic seat has two Democrats in the general, so that one can’t change hands. But the two Republican seats, including Spokane’s 6th District between Jeff Holy and Jessa Lewis, are more in doubt based on close primary results. Holy finished the primary almost 2,000 votes ahead of Lewis, although she was leading on election night and has outraised him in campaign contributions. In the 26th District, which covers parts of Pierce and Kitsap counties, Democrat Emily Randall finished almost 1,300 votes ahead of Republican Marty McLendon and has raised almost twice as much money in one of the most expensive legislative races in the state. Listen to “Candidate forum for 6th District House with Jessa Lewis” on Spreaker. Many incumbents sailed easily through their primary, and a few were unopposed. But two Republicans – Doug Ericksen and Mark Miloscia – failed to get 50 percent of the vote and another, Keith Wagoner, finished second in a four-way primary. Sen. Joe Fain, an Auburn Republican whose voting record is more moderate than most of his caucus, finished the primary some 2,200 votes ahead of Democrat Mona Dos. But the 47th District is considered a suburban swing district, and in recent weeks Fain has been accused of a sexual assault some 11 years ago. Fain strenuously denied the accusation and called for an investigation, but so far none has been started. Last week, he got support from GOP colleagues and an independent campaign that gets money from some of the state’s largest businesses and their industry associations. Democrats hold a 50-to-48 majority in the House, but could have a bigger lead in 2019 as a result of more competitive races than in the past several election cycles. Among the factors working in the Democrats’ favor is the number of departures or retirements that have left eight seats open, six held by Republicans. One is Holy’s in Spokane’s 6th District, which features Democrat Dave Wilson against Republican Virginia Graham. Although the 6th is a traditionally Republican district, Wilson finished nearly 3,000 votes ahead of Graham in the four-way primary, and more Democratic than Republican votes were cast overall. Republican Mike Volz, seeking his second House term, finished about 200 votes ahead of Democrat Kay Murano in the primary. If a “blue wave” boosts Wilson and Murano to the top of the general, Democrats would hold both of those seats for the first time since Franklin Roosevelt was president. In five of the other open Republican seats, Democrats came out on top in the primary. In the open Democratic seats, the votes were split among multiple candidates, but the Republicans who made it through the primary got less than a third of the votes. Eight Republican incumbents finished behind Democratic challengers in the primary. Two incumbents – one Democrat and one Republican – were ousted in the primary, but in each case their party seems likely to hold the seat. In the central Washington race between Republican Rep. Matt Manweller, of Ellensburg, and Democrat Sylvia Hammond, of Ephrata, the primary wasn’t close, but the general election could be. Manweller, a three-term incumbent, was asked by the GOP House Caucus to step down because of allegations of questionable activities in an investigation by Central Washington University, where he taught political science. Although he has denied the allegations and threatened to sue the university, Manweller said he would relinquish his seat if he wins. A new political action committee, Enough is Enough, has spent more than $100,000 against Manweller in the past month. Republicans in the district already are applying to be his replacement, which will be nominated by GOP precinct officers and selected by the county commissioners if Manweller wins, then resigns. This story was altered Saturday, Nov. 3, to correct an error in the count of state senators up for re-election this year. There are 11 Republicans and 14 Democrats who hold seats that are up for election. Published: Nov. 3, 2018, midnight Updated: Nov. 3, 2018, 3:54 p.m.